It’s now been a week into the 2012 school year. For me, this year is a little different – I am only teaching one class! At my school we are implementing an integrated curriculum for year 7 as a middle years strategy (and it’s actually a proper integrated curriculum; not just me teaching multiple subjects). Year 7s have one teacher for English, Maths, Science, Geography and History, and I’m lucky enough to be one of those teachers. I see my Year 7s all day Monday and Friday and two hours on Tuesday and Wednesday. This is a huge change from I was used to. I see this as an opportunity to really get to know my students and implement a lot more problem based learning (PBL). There has been many learning activities I want to implement and some I have implemented that are long-term projects and did not work as well as they could have due to the rigid high school timetable. Seeing students for large chunks of time makes PBL a lot easier. 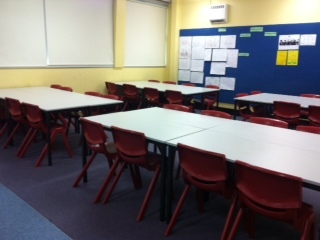 I know this doesn’t sound like a big deal, but I have moved my desks from rows to groups. I wanted the physical space to reflect how my students will learn best. My classroom is actually a science laboratory so it’s double the size of regular classrooms. There is enough space for students to work in groups on the regular tables and move to the practical benches if they need to work independently or in smaller groups away from the rest of the class. I eventually would like my students to choose the space that would allow them to work the best for a particular activity. There is no front of the classroom. There are three sides of the room where information are displayed – the interactive whiteboard (IWB), the side wall and a regular whiteboard on the opposite side of the room. 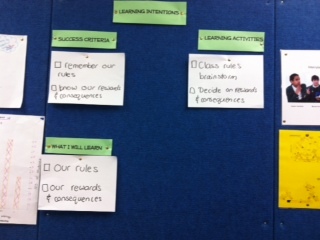 The side wall holds learning intentions and success criteria for the lesson and the IWB and the regular whiteboard are used by students. 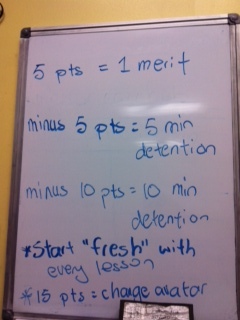 Year 7s came up with 5 class rules. We then used Class Dojo to come up with positive behaviours and negative behaviours that would gain points or lose points respectively. Year 7s devised a reward system where 5 points would gain a merit award and every 15 points they accumulate will allow them to “level up” and choose a new avatar for themselves on ClassDojo. When I first used Edmodo last year, I used it as space to upload files. Lesson resources, worksheets and quizzes were uploaded onto Edmodo. Half way through last year I started using Edmodo as an online space for students to share and collaborate. Students started to share links, samples of work and PrimaryPad was embedded for groups of students work collaboratively. This year I wanted to continue this and extend it further. 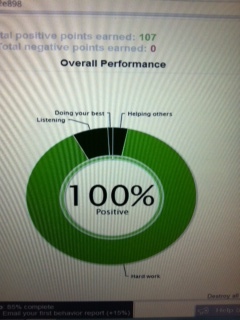 It’s good to see that when I scan the page of my year 7 Edmodo group, most of the posts are made by students and NOT me. This entry was posted in learning, middle years by Alice Leung. Bookmark the permalink. Thanks for sharing this. It certainly sounds fascinating and challenging.